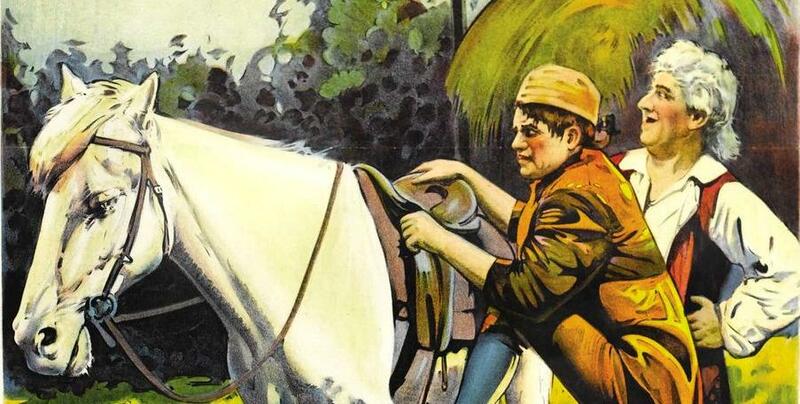 The Headless Horseman (1922) Review – AiPT! I’m always up for an adaptation of The Legend of Sleepy Hollow; it’s one of America’s greatest ghost stories, after all. The first adaptation of Washington Irving’s timeless yarn was this 1922 silent film starring Will Rogers. Dwelling within the public domain, it’s pretty easy to find, being a staple of cable access “spook shows” and as part of those “fifty horror movies for $10” DVD sets. But just because The Headless Horseman is old, does that make it a classic? Ichabod Crane (Will Rogers) has just rolled into the quiet village of Sleepy Hollow to take over as the new schoolmaster. He quickly becomes enamored with the lovely and wealthy Katrina Van Tassel (Lois Meredith), which doesn’t go over too well with her most prominent suitor, Brom Bones (Ben Hendricks Jr.). Through various practical jokes and rumors, Brom plots to convince the God-fearing people of Sleepy Hollow that Ichabod is in league with witches. Tar and feathers might be the least of Ichabod’s worries, however, as he finds himself face to face with Sleepy Hollow’s most vicious spook: The Headless Horseman. Screenwriter Carl Stearns Clancy and Director Edward D. Venturini strive to be as accurate to Washington Irving’s original tale as possible. Lots of minute details which are often left out of most adaptations find their way in, such as Ichabod boarding on a weekly basis with local farmers whose children he instructs (a lot of adaptations simply have him living in his own school house). There’s even a small scene taken directly from the story in which Ichabod cradles a child in each arm while rocking a crib with his foot. One large detail from the story which is almost always left out of modern adaptations is the portion of the ending which reveals that Katrina was stringing Ichabod along the entire time (as a means to provoke Brom) and coldly rejects Ichabod’s marriage proposal. I was pleased to see it retained, as taking it away only succeeds in altering Katrina’s character. Despite their dedication to accuracy, Clancy and Venturini still had to fill seventy minutes. Due to this, an entirely fabricated subplot is thrown into the middle of the film to stretch things out. Brom’s plot to ruin Ichabod’s reputation, resulting in Ichabod being attacked by a mob and nearly tarred and feathered, was never in the story. It’s not exactly a terrible way to stretch the runtime, but still comes across as some pretty boring filler. In the story, Irving hints very broadly, to the point of “Well duh,” that Brom was the Headless Horseman in disguise. This adaptation takes it literally, showing Ichabod recovering from his pumpkin to the face and hightailing it out of Sleepy Hollow as Brom unmasks himself and has a good hearty chuckle. While the bit about old wives insisting that Ichabod was spirited away by the Horseman is retained as an epilogue, it loses its mystique when they show Ichabod running away as Brom removes his costume. I think one of the reasons the Walt Disney animated adaptation remains so popular to this day is because it left Ichabod’s fate more ambiguous in the end (even if that was contrary to the source material). It could be the Headless Horseman or it could be Brom Bones or it could be the freakin’ Lone Ranger, for all I can tell. These public domain DVD transfers are s--t.
Looking at the revelation in a broader scope of silent horror films of the era, it does fit right in the with a popular trend seen in the “old dark house” subgenre. If you watch movies such as The Cat and the Canary, The Bat or The Monster, they all begin with a supposedly supernatural threat stalking the main characters, only for the creature to be unmasked at the end and revealed to have been human all along. It’s regarded as the “Scooby-Doo” bait-n-switch these days, but the gimmick was very popular back in the era of silent horror pictures. With that in mind, I guess it’s no surprise that the silent adaptation of The Legend of Sleepy Hollow ended with a decidedly mortal unmasking. Being made in 1922, it’s pretty low key in the effects, not really striving to do anything revolutionary. The Horseman’s first appearance during a prologue was done fairly well, featuring some good-for-their-time transparency effects and a nice shot of the Horseman’s skeletal hand beckoning his spectral stead to rise with him from the grave. Unfortunately, it takes the Horseman two attempts to mount the stead because the actor can’t see what he’s doing. Not exactly the most intimidating first impression. The public domain version I watched (a rotten transfer tacked onto The Mechanical Man from Alpha Video) had a wholly inappropriate jazz score attached to it. After about three minutes of listening to it, I muted the screen and popped in a “generic Halloween music” CD I had lying around. Yeah, yeah, yeah, Bach’s Toccata and Fugue in D minor may be the most clichéd “scary music” on the books, but at least it didn’t leave me feeling like Ichabod and the Horseman were liable to start jitterbugging at any given moment. Overall, The Headless Horseman is one of the most accurate adaptations of The Legend of Sleepy Hollow you’ll ever view, working in lots of details that are almost always omitted. Unfortunately, modern adaptations tend to omit those details because they spoil the supernatural angle of the story, to say nothing of slowing down the pace. To make matters worse, this one stretches the source material further than it can handle, adding a boring new subplot to the already boring details that were better off being skipped. I guess The Headless Horseman is proof that just because it’s a silent film, that doesn’t mean it’s a classic.